I’m feeling somewhat nostalgic about our amazing trip to Italy last summer, so I’ve decided I’m going to do my best to take a moment each day for the next two weeks to post a memory from that incredible vacation. The image depicted, captured outside the Duomo in Firenze, reminds me of both solitudes. The young man unabashedly languishing in the heat, while a woman at the other end of the stone bench nurtures her gelato. 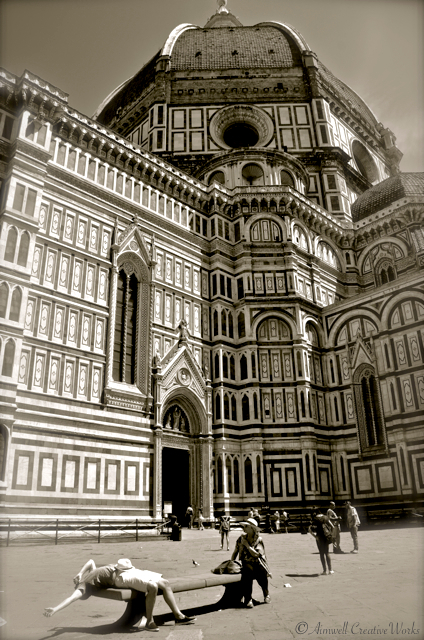 This entry was posted in Italy, Photography, Travel and tagged Aimwell CreativeWorks, black and white, Dorothy Chiotti, Firenze, gelato, heat, Italy, monochrome, Photography, summer, Travel, Weather. Bookmark the permalink. Oh what a good idea. We sometimes forget to look back on our holidays and treasure those moments. I’m looking forward to hearing all about yours. Love this photo, Dorothy. I, too, have been in Italy when it was impossibly hot and no doubt have looked as exhausted as that fellow at times, but have also consumed my fair share of gelato. Thanks for the memory jog! Thank you … It is such a beautiful place.